Leave it to Sir Clive to come up with some of the first full color computers. And, of course, they would be tiny. And, of course, they would be cheap. (Cheap in terms of price, not construction.) And, of course, they would expand BASIC keywords from single key presses. And, of course, Sir Clive's BASIC would require that you actually use the LET statement. And, of course, they would have rotten keyboards. (Sorry, couldn't resist. This one has the rubber-sheet chiclet type of keyboard.) These early color computers could do fantastic (fairly) high-resolution graphics in a variety of colors. 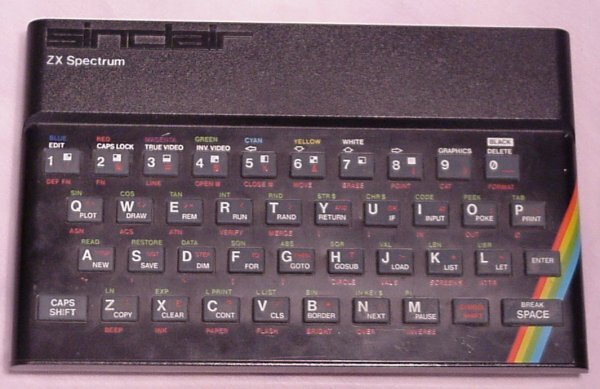 Click here to view all comments for the Sinclair ZX Spectrum and to leave your own.